Manulife Insurance's Toronto headquarters is photographed on Sept. 27, 2017. Manulife Financial Corp. and Power Financial Corp. have more than a few things in common. But here’s the big one: These former stock-market superstars have done poorly since the eruption of the credit crisis, underperforming other Canadian financial companies by a wide margin and leaving long-term investors exasperated. From their peak in October, 2007, Manulife shares are down 52 per cent, without factoring in dividends. Power Financial shares are down 36 per cent from their high point in May, 2007. The pain for investors is widespread. Practically every Canadian owns at least one of the two stumbling giants through their mutual funds, pension funds or stock portfolios. Compare their performance with the biggest banks: Royal Bank of Canada is up 63 per cent from its precrisis high in 2007; Toronto-Dominion Bank is up nearly 90 per cent. The shares of all of the Big Six domestic banks are higher, in fact, suggesting that a business model based on lending money may be more resilient than one that relies on selling insurance and mutual funds. If you had invested in Manulife or Power Financial five years ago, as the North American economic recovery was gaining momentum – a fine backdrop for most companies – you would still have earned almost nothing. Interest rate increases, which are supposed to light up insurance profits, have failed to gain much traction. Some of their peers have struggled as well over the past decade. But the shift is particularly striking for Manulife and Power Financial because of the stark contrast with their go-go years, when they could do no wrong. Manulife’s share price rose nearly fivefold between 2000 and 2007, soon after it demutualized, emerging as a dynamic global force during a period of industry consolidation. Power Financial rose more than twelvefold between 1995 and 2007, instilling the belief that this was a stock you could embrace for life alongside the company’s controlling shareholders, the Desmarais family. Now cut to the disappointment. Life insurance has lost some of its importance with consumers, tighter financial regulations are raising operating costs, and persistently low rates are eating into the profit margins. Both companies have made acquisitions that haven’t panned out, and they face threats from the growing popularity of cheap investment products such as exchange-traded funds (ETFs), which are squeezing the fees of asset managers. “It seems to me that the business model is headed for oblivion. [The industry relies] on an incredibly expensive distribution network, which can only function by selling really expensive products,” said Larry Bates, the former global head of debt capital markets at Royal Bank of Canada and more recently the author of Beat the Bank: The Canadian Guide to Simply Successful Investing. Others say Manulife and Power Financial suffer from too much complexity – and that comes from pros who know their way around corporate balance sheets, but who also say that the actuarial assumptions that underpin the companies' operations can be black boxes. “These companies are very difficult to analyze,” said Stephen Takacsy, chief investment officer and lead portfolio manager at Lester Asset Management in Montreal. Roy Gori, chief executive officer of Manulife. No one minded the complexity when the stocks were making investors rich. Now, it’s just one more reason to stay away. Not everyone is, though. Low stock valuations are raising hopes among some analysts and investors that Manulife and Power Financial are bargains, poised to regain some affection from the market. Manulife made a couple of lists of top stock picks for 2019. And top executives at both companies believe they have the right strategy for winning back investors. So what has to go right for Manulife and Power Financial to shake off the past decade and return to their winning ways? If you push aside the brain-numbing actuarial science, the insurance business is actually straightforward. Customers who want to protect themselves financially against illness or death pay premiums to insurance companies. The companies invest the money – largely in government and corporate bonds – so that they can meet their obligations to policy-holders down the road. Problem is, low interest rates have diminished the yields on bonds, which comprise 51 per cent of Manulife’s asset mix and 72 per cent of the asset mix at Great-WestLifeco Inc., the insurance holding of Power Financial. Even today, following a succession of rate hikes since 2017, the Bank of Canada’s overnight rate sits at just 1.75 per cent, versus 4.5 per cent in 2007. The prospect of low investment returns influences insurers’ liabilities, the premiums they charge and the products they offer. And it weighs heavily on their profits. In 2007, Manulife generated operating income (adjusted for unusual gains and losses) of $6.7-billion; in 2017, its operating income was 30 per cent lower, at about $4.7-billion. Over the same 10-year period, profit margins declined from 19.4 per cent to just 8.4 per cent. Moving toward stocks and other investments might juice insurers’ returns, but it exposes them to risks tied to the stock market, so they’re stuck. The wealth management business, which is a natural fit with insurance, has its challenges, too. The popularity of ETFs, which generally track indexes at a fraction of the cost of mutual funds, are forcing money managers across the wealth management spectrum to cut their fees to stay competitive. Even so, asset managers are struggling to hold onto assets as ETFs capture consumer interest. 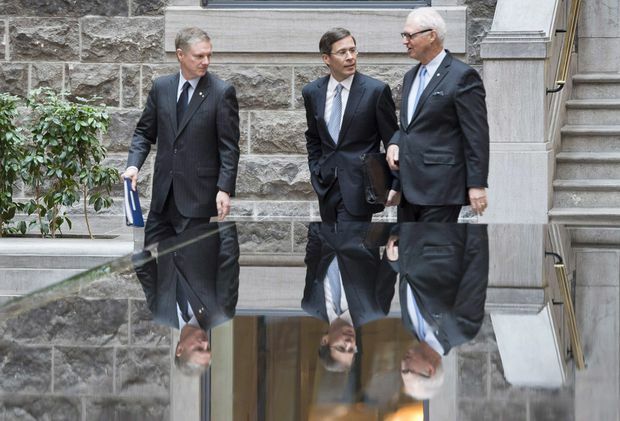 From left, Power Financial chairman Paul Desmarais Jr., president and CEO Jeffrey Orr and co-chairman Andre Desmarais, head to the company annual meeting in Boucherville, Que. on May 14, 2014. The solution to these challenges? Cut costs, trim fees, add new products, get more tech savvy and bulk up. But it’s a slow process. Jeffrey Orr, Power Financial’s CEO, knows that when his company’s numerous entities are laid out in an organization chart they can resemble a Christmas tree. The holding company has significant stakes in IGM Financial Inc., an asset manager, and Great-West Lifeco, the insurance company. Both are publicly traded, and they operate under banners such as Investors Group, Mackenzie Investments, Putnam Investments, London Life and many others. Oh, and Power Financial is a holding company within another holding company, Power Corp. of Canada. The structure gives the Desmarais family a lock on control: The family trust owns a 21-per-cent ownership stake in Power Corp. and through the magic of multiple voting shares it has a 59-per-cent voting stake that gives the trust sway over every corporate entity. 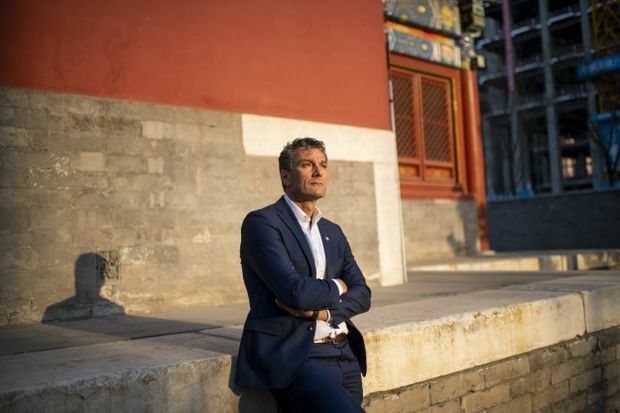 What the Desmarais family says, goes – a high level of control at a time when some critics believe the family has become risk-averse. But the way Mr. Orr sees it, Power Financial’s structure boils down to three confluent businesses: It helps groups and individuals accumulate wealth, manage wealth and hedge their risks. And while these businesses are being buffeted by changes beyond Mr. Orr’s control – he doesn’t set interest rates or dictate consumer preferences – he can slash costs, ditch underperforming elements and build market share in areas where bigger is better. He expects Power Financial will make a significant acquisition in the United States, where it controls Putnam Investments, a global asset manager with US$160-billion in assets under management. He believes that larger scale translates into cost advantages. And he is looking for meaningful contributions from businesses that are still developing. Power Financial and IGM own a significant stake in Wealthsimple Financial Inc., a robo-adviser that is leading the charge toward low-cost online investment management. But Mr. Orr is not overpromising. “The organic growth that we have right now is not what it was historically. So when we do what we’ve done for the last five years, which is deliver pretty solid single-digit growth in adjusted earnings, that’s a lot of hard work to get there,” he said. Mr. Gori is facing similar challenges at Manulife. He must reassure investors who were dismayed by Manulife’s deep troubles during the financial crisis – it cut its dividend in half in 2009 and issued new shares amid concerns about its capital levels – that the insurer can still thrive. And he is saddled with John Hancock Financial Services Inc., the Boston-based insurer that Manulife bought for $15-billion in 2004 with tremendous fanfare. The acquisition briefly made Manulife the most valuable Canadian company, based on the total value of its shares. But John Hancock has since become a dead weight, with longer lifespans and rising health-care costs dragging on the performance of its long-term care business. A number of observers believe that the division should be jettisoned – and the fact it hasn’t been divested is raising concerns that no one wants it. Mr. Gori, though, believes that today’s Manulife is radically different than what it was prior to the financial crisis, when it ran into a load of trouble. Its sensitivity to interest-rate fluctuations is a fraction of what it was 10 years ago, he said. And through hedging, its sensitivity to stock-market volatility is half of what it was. He’s also betting big on Asia, where the middle class is growing fast. He expects that Manulife’s 120-year history in the region, along with the fact that it already operates in 12 markets there, gives the company a competitive advantage that will drive a larger share of the company’s profits within five years. In North America, Mr. Gori is pushing for greater efficiency. He’s controlling spending (third-quarter growth in expenses was 5 per cent, half the five-year average) he’s investing in technology (the insurance business, he said, is stuck in the dark ages) and freeing up at least $5-billion in capital by moving out of underperforming areas. “I don’t think there is one magic bullet that will solve all issues or unlock all value,” he said. But he expects that shifting financial resources into more promising operations will improve Manulife’s return-on-equity ratio, which should help the stock. Both Manulife and Power Financial have one standout feature that is drawing the attention of some investors: The stocks look exceptionally cheap, implying limited downside risk and significant upside potential if the companies can get moving again. Manulife shares trade at just 8.5 times reported profit, or about half what the price-to-earnings ratio was in 2007, according to Bloomberg. Power Financial’s price-to-earnings ratio is also historically low, at 9.8. Price-to-book values, which compare share prices with net assets, are also well below what they were more than a decade ago. Manulife’s price-to-book ratio is just 1.04 today, versus 2.58 in 2007. And by some estimates, Power Financial’s market capitalization represents a 20.2-per-cent discount to the value of its underlying assets, according to Desjardins, which is well above the 10-year average discount of 13.4 per cent. At the same time, dividend yields, which compare annualized payouts with share prices, are remarkably high: Manulife, not a dividend powerhouse before, now yields an impressive 4.7 per cent and Power Financial yields 6.3 per cent. That’s about double what either stock yielded in 2007. Why so inexpensive? Analysts suggest that there is a lack of confidence in profit growth and lingering concerns about acquisitions, including Manulife’s John Hancock. The bigger picture isn’t pretty either. The S&P/TSX Composite Index remains volatile, which is weighing on sentiment toward insurers and asset managers. And although the Bank of Canada has raised its key interest rate from ultralow levels over the past couple of years, further increases are on hold amid forecasts of slowing economic growth – a head fake for anyone who bet that profit-boosting rates were here to stay. The idea that Manulife and Power Financial pale next to their own boom years may also be weighing on sentiment. After all, second acts are rare. Between the start of 2000 and October, 2007, Manulife’s share price surged 391 per cent, or 462 per cent after factoring in rising dividends. Dominic D’Alessandro, Manulife’s CEO between 1994 and 2009, reigned as Bay Street royalty. Power Financial began its ascent earlier. From the start of 1995 to its peak in May, 2007, the stock soared 1,113 per cent, or 1,590 per cent with dividends – outperforming the likes of Apple Inc. (pre-iPhone, but still) and cementing the reputation of the Desmarais family, led by the late Paul Sr., as empire builders. That makes for tough comparisons. Nonetheless, some bargain-hunting investors are discovering that attractive valuation metrics are becoming impossible to ignore at a time when some performance metrics are improving. RBC Dominion Securities expects that Manulife’s return-on-equity will improve to 13.4 per cent in 2018 (it will report its year-end results on Feb. 13). That’s still well below ROE of 17.3 per cent in 2007, but it marks a 10-year high. Similarly, RBC expects that Power Financial’s Great-West Lifeco’s ROE will rise to 14.4 per cent in 2018. “Typically we don’t own any Canadian companies in our global fund. But Manulife has gotten so cheap that we added it to the global accounts this past fall,” said John Hadwen, a portfolio manager at CI Investments’ Signature Global Asset Management in Toronto. Sure, Manulife has issues. But enthusiasts believe that the share price is already discounting the ugly parts. Analysts at Canaccord Genuity and BMO Nesbitt Burns have added Manulife to their top Canadian stock picks for 2019, arguing the stock price could rally as much as 50 per cent this year. Profit in Asia rose 22 per cent in the third quarter, year-over-year. And a focus on cost-cutting has identified $1-billion in unnecessary expenses. Interest in Power Financial is also stirring. Robert Gill, a portfolio manager at Lincluden Investment Management, a discretionary investment management firm in Mississauga, recently took a position in the stock with the belief that the share price was out of whack with the quality of the company. “We think that the future is brighter than the past. If you couple that with the fact that you’re getting it at a very attractive valuation multiple, there’s a margin of safety in that,” Mr. Gill said. Desjardins Securities upgraded the stock to a “buy” recommendation in mid-December. It’s a notable shift for the brokerage given that Desjardins had been relatively unenthusiastic about the stock for the previous two years. And Paul Holden, an analyst at CIBC World Markets, turned bullish on IGM Financial – Canada’s largest independent money manager and a core component of Power Financial – nine months ago, for the first time since covering the stock over the past decade. “What has changed? IGM is a far better company today in terms of strategy, competitive positioning and financial efficiency,” Mr. Holden said in a note last year. The company has slashed fees to stave off irrelevancy in a low-fee world, embraced high-net-worth clients and cut costs. Mr. Holden expects that its assets under management, which drive fees, will rise by more than 7 per cent in 2019. Analysts and fund managers can be wrong, of course. And CEOs are cheerleaders for their own causes. But at least they’re pounding the table for cheap, out-of-favour stocks rather than trying to sustain a bubble. “We can tell our story the best we can, and we have increased our presence in front of investors a lot in the past 12 months to ensure that investors understand what we’re doing, what is our value creation strategy, how we’re trying to deploy capital – on the belief that at some point people will recognize value,” Mr. Orr said. Power Financial’s share price fell 25 per cent in 2018, though. Investors may need more convincing.